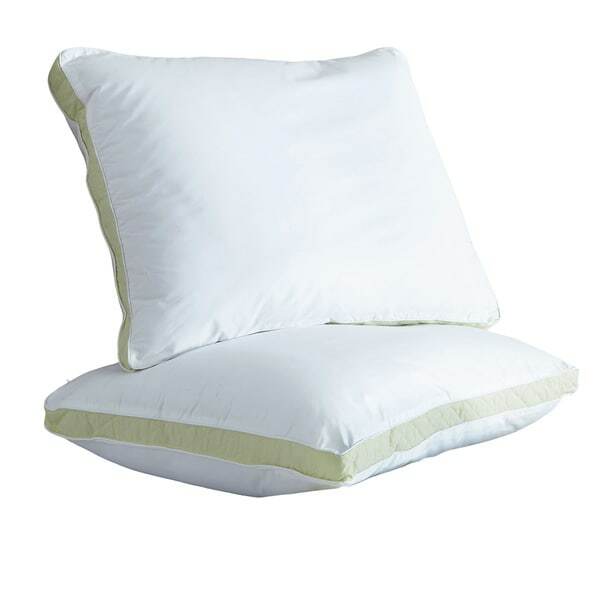 This uniquely designed pillow from Rest Remedy, one of the most well-known names in bedding, features a generous gusset that matches personal sleep preference. The pillow features a gusset that matches personal sleep preference. Honestly I have been skeptical to purchase a pillow online. I am quite particular when it comes to my bedding. I purchased these density pillows in medium and firm for my guest room in hopes that I would be able to cater to multiple guests needs during there stay. To my surprise I received these quickly and was pleasantly surprised by quality. My mistake was when I decided to try out the medium density. Now I am having to purchase more because I can not sleep without it. It gives me just enough support during my sleep- usually I toss an turn at night and wake up with a sore neck. With this pillow I feel like I toss less and my neck has not been sore since!. I am very happy with my purchase and with my overall experience with overstock. I would suggest this pillow to anyone looking for an affordable quality pillow. You can purchase to cater to your sleeping needs. Just be aware you might enjoy the pillow so be prepared to order more than one ! Tried these out in firm, great sleep like a baby. They don't lose shape. Spring back quite well. After all its just a pillow but its good for side sleepers like me. I like a firm pillow these really provide great support ad the price was also a deciding factor. Firm and comfortable! Good pillows and long enough for king size. Really like the "side wall gusset" for extra strength firmness Rest Remedy pillows. They are actually "too giving" for my big heavy head tho'. The wife says this extra firm is perfect for her. Still looking for the "Holy Grail" of pillows that's somewhere between a rock & a marshmallow. BUT the Rest Remedy in Extra Firm is probably close as that will ever get for this guy. I ordered these pillows in king size extra firm and firm. I love the extra firm! They are the first pillow I've ever ordered that were truly xtra firm! I ordered both because some of the comments said the extra firms were too firm and my husband thought the extra firm was too firm and he preferred the firm pillow. I highly recommend these pillows. The delivery was prompt and a great price. Thank you Overstock! Good value for a quality pillow. True to size. I chose a medium density but being a side sleeper I should have chosen an extra firm for my desired support. They are filled nicely, quality fabric, good stitching. I use them for my sham inserts on the master bed. I would recommend this item. I'd say these were excellent, but my husband finds them too high/thick. i love them though. So the first time the pillows got delivered they were eligibly taken from my front porch. In my distress I called overstock.com and they worked with UPS. They were unable to locate the missing pillows however overstock sent me a replacement at no cost. I have my pillows now and they are great. I am so pleased with overstock. Thanks so much. Lovely pillows for a great price. Supportive and comfy! Can't say I'm really thrilled with these pillows. I don't find them particularly comfortable...but they could be worse. Pillows are hard to buy anyway though. These flatten quickly, do not fluff easily and sleep hot. I would say they are fine for the price, however, to have for xtra pillows on the bed and for something to cuddle up to. FIRMNESS GIVES OUT RATHER QUICKLY. These pillows are fine, at first, but they go flat rather quickly. I bought an extra-firm queen size, and I just noticed that I am replacing them after only four months! I bought two of them for less than half of the price they are asking today. They are now way overpriced, and I will buy something else. I purchased these pillows for my bed. They are wonderful. Good quality and good price. Very pleased. I like the soft comfort of these Quilted Density Pillow. Although they are firm, they are soft and comfortable. I have had them for a few months and they have not gone flat. I recommend them to anyone looking for a comfortable pillow. they are great. I love these pillows. Went middle of the road with firm because I wasn't too sure but it was the right pick! I stack 2 on the bed when I want to sit up in reclining position but enough play in the pillow that I can sleep on my stomach without straining my neck (with 1 pillow). I was not sure what to expect but they are a little more firm than I wanted but are good for resting against. Bought for my husband and he absolutely loves them! He has been searching for a good firm pillow and I think we’ve finally found it! Sleep well very comfortable recommend to purchase . These pillows were exactly what I wanted. A firm pillow without being a brick! I will be ordering more of these very soon. "What are the measurements of the queen extra firm pillow?" Actual Finished Size is 20 x 30. "I have having difficulty deciding which "firmness" to buy. We need "king" size, and it appears that Extra Firm is the only firmness available in "king". We are both "side-sleepers". My concern is that they may be too rigid?" Hello Cynthia, at this time we only have extra firm available in the king size. We can appreciate the fact you want a firsthand account of the product. You will receive an email notification every time you get a response. Thank you for shopping with us. "Hi How could i order king size extra firm cause it is not mentioned under options"
Hello rmsalameh, unfortunately this item is out of stock in king size extra firm. We cannot guarantee the item will be restocked. Thank you for shopping with us. "Is this pillow really firm? I need it to be really firm for my neck, I do not want my face to push into it/smash"
Hello Jean, we can appreciate the fact you want a firsthand account of the product. You will receive an email notification every time you get a response. Thank you for shopping with us. "We are looking at the Restonic pillows. These come in sets of two. However my wife and I sleep on different firmnesses. Can these be ordered with two different firmnesses?" Hello BillW, I'm sorry we do not have that option available. I was looking for a FIRM,king size pillow.Most are not as advertised.I hope these do not disappoint. High ratings, reasonable prices, wide variety of choice in sizes and densities.